Save 20% when you buy workbooks by the case! God can turn any marriage into a masterpiece. 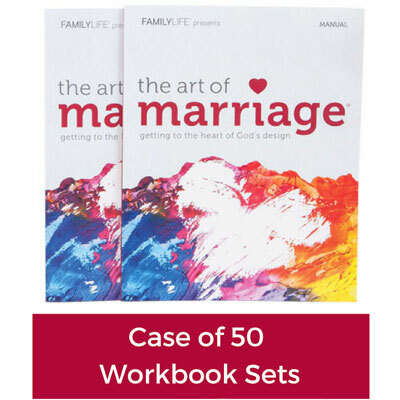 Conveniently packaged in sets of two for couples attending The Art of Marriage® video event, each manual offers help for you to live what you learn through the six dynamic sessions. More than a workbook, this manual has helpful articles and tips for building a stronger marriage. This case includes 50 sets, so you can equip 100 participants at your event! For more than three decades, FamilyLife® has been helping couples understand God's plan for relationships. In The Art of Marriage video event, we weave together expert teaching, engaging stories, man-on-the street interviews, humorous vignettes, and much more to portray both the challenges and the beauty of God's design for marriage. The six sessions can be presented in a one-day or weekend format (Friday night through Saturday). For maximum impact, purchase a set for every couple attending. The manuals are essential for fully experiencing the video event and provide additional information and guidance after it ends. The mission of FamilyLife® is to build godly marriages and families that will change the world, one home at a time. It expands with our compassion for families in need of help, and for those the Bible calls helpless. Through our getaways, broadcasts, web site, and resources, we are seeing God rewrite the legacies of husbands, wives, and children everywhere.